A brass dragon’s desert lair is typically a ruin, canyon, or cave network with ceiling holes to allow for sunlight. A strong wind blows around the dragon. 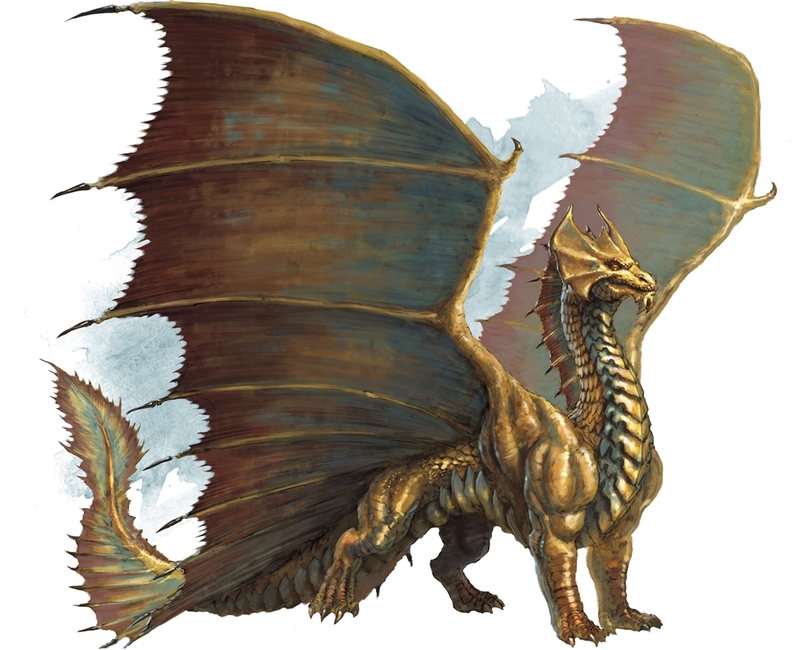 Each creature within 60 feet of the dragon must succeed on a DC 15 Strength saving throw or be pushed 15 feet away from the dragon and knocked prone. Gases and vapors are dispersed by the wind, and unprotected flames are extinguished. Protected flames, such as lanterns, have a 50 percent chance of being extinguished. A cloud of sand swirls about in a 20-foot-radius sphere centered on a point the dragon can see within 120 feet of it. The cloud spreads around corners. Each creature in it must succeed on a DC 15 Constitution saving throw or be blinded for 1 minute. A creature can repeat the saving throw at the end of each of its turns, ending the effect on itself on a success. Tracks appear in the sand within 6 miles of the dragon’s lair. The tracks lead to safe shelters and hidden water sources, while also leading away from areas that the dragon prefers to remain undisturbed. Images of Large or smaller monsters haunt the desert sands within 1 mile of the dragon’s lair. These illusions move and appear real, although they can do no harm. A creature that examines an image from a distance can tell it’s an illusion with a successful DC 20 Intelligence (Investigation) check. Any physical interaction with an image reveals it to be an illusion, because objects pass through it. Whenever a creature with an Intelligence of 3 or higher comes within 30 feet of a water source within 1 mile of the dragon’s lair, the dragon becomes aware of the creature’s presence and location. If the dragon dies, the tracks fade in 1d10 days, but the other effects fade immediately.